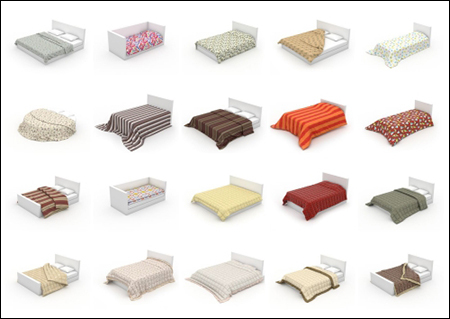 HQ Details vol 4 is a large collection of beautiful and high-quality 3d models of Blankets & Pillows. It contains over 110 realistic 3d models for Cinema4D, fully mapped, high-detailed geometry, no displacement. All models have materials, textures and ready for rendering in Cinema 4D Advanced Render, VRAYforC4D, Maxwell Render. We recommend to use 64-bit version of Windows, MacOS and Cinema 4D to improve speed, stability and overall performance of your system.All models have materials, textures and ready for rendering in Cinema 4D Advanced Render, VRAYforC4D, Maxwell Render. We recommend to use 64-bit version of Windows, MacOS and Cinema 4D to improve speed, stability and overall performance of your system.